In 1921, Thomas Edison created an employment questionnaire for college graduates who wanted to work for him. The questionnaire was so tough that New York Times called it a “Tom Foolery Test”. Today, the trick to acing an interview is knowing how to present yourself–not just in person but across video and phone as well. According to an Office Team survey conducted in 2012, 6 in 10 companies in the United States conduct video interviews to recruit employees. Interviews over video conferencing programs, such as Skype, are cost-efficient and time saving, making the recruitment process faster and more efficient. Additionally, video interviews can be recorded and viewed later. 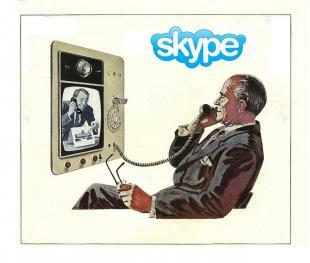 Apart from Skype 5.0, ooVoo and Tokbox are some popular and low-cost video chat services used for online interviews. A picture of you on spring break next to the username “BunnyLover27” isn’t going to impress an video interview panel. Usernames shouldn’t be anything too casual or unprofessional, so stick to your real name or some variation. Also, make sure the display picture looks like you. Avoid having pictures of your pets, partner, celebrities or random objects. Always confirm what kind of interview – video or voice – the employer is planning to conduct so you can properly prepare. Additionally, make sure you have the username or number you will be calling. Lastly, time zones can be confusing, so double check the time and date when the interview is going to be conducted. WorldTimeBuddy is a favorite tool around the OpenSesame office–just plug in your time zone and that of the interviewer to see the corresponding time for your zone. For a video interview, you’ll need to decide where you will be shoot the interview. If you are uncomfortable taking it at home, find out if your university or local library has a private room you can reserve for the interview. The background should be free of clutter that might otherwise distract the interviewer. It should also be quiet and well lit so interviewers can see your face. Be sure to check the test the wifi prior to the interview to make sure you won’t cut out. Dress professionally for the video interview. It is important your clothes standout from the background. Even if you are in a different timezone than the interviewer, dress as you would if you interviewed in person. Remember first impressions are important, so don’t forget to wear a smile! Video interviews give you room to have some of your notes and material with you. Have a copy of your resume, write down talking points and questions you want to ask on sheets of paper and place them strategically on your table, where your eye can catch important phrases and sentences. Video chats are different then in-person. Looking at the screen during a Skype video interview will not give you eye contact with the interviewer. You want to look at the camera and practice speaking to it. This can be tricky, so it’s a good idea to check your settings and practice with a friend or family member. Send a thank you email to your interviewer as you would after any normal interview. It is another way to create a good impression and show your interest in the job. While they may seem intimidating, video interviews place a lot power in the hands of the interviewee. Unlike an in-person visit, you have the opportunity to control the environment and how you are presented. Planning on conducting video interviews in the future? We’ve got you covered as well.